Given the fierce growth that India is witnessing in telecom space, it is no surprise that Mobile is now becoming an important channel for consumer advertising. Infact, according to the latest report released by inMobi, India is now the largest mobile advertising impressions market in whole of Asia Pacific region. The inMobi report shows that mobile advertising impressions increased by over 22% in last 3 months alone to touch nearly 1 Billion impressions. The growth in mobile advertising is primarily due advertisers and publishers embracing Mobile advertising as a medium. It is quite interesting that even though Smartphones have been quite popular in India, they represent a small fraction of mobile ad impressions (Android & iPhone OS have 0.4% share combined). Not only that, the growth is quite slow. While advanced feature phones showed about 26 percent growth in last 3 months, smartphones grew only about 1%. 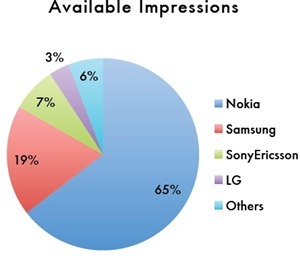 Nokia is still the king by a very large margin – 64.7 percent of all the mobile ad impressions come either from Nokia O.S or Symbian O.S. Android, iPhone OS and Windows mobile O.S all account for piddly 0.2 percent each! It will be interesting to see how long does Nokia reign supreme in India. In many other countries across the world, it has already lost its footing and in India people have started preferring other brands to it. You can download the complete inMobi report from here. Was wondering what you meant by Advance phone? I understand the term – but what phone does this cover? Also, I will not be surprised that in the coming next 6 months to one year there will be significant change in the spread. It will be more Andorid, IPhone and Windows OS.